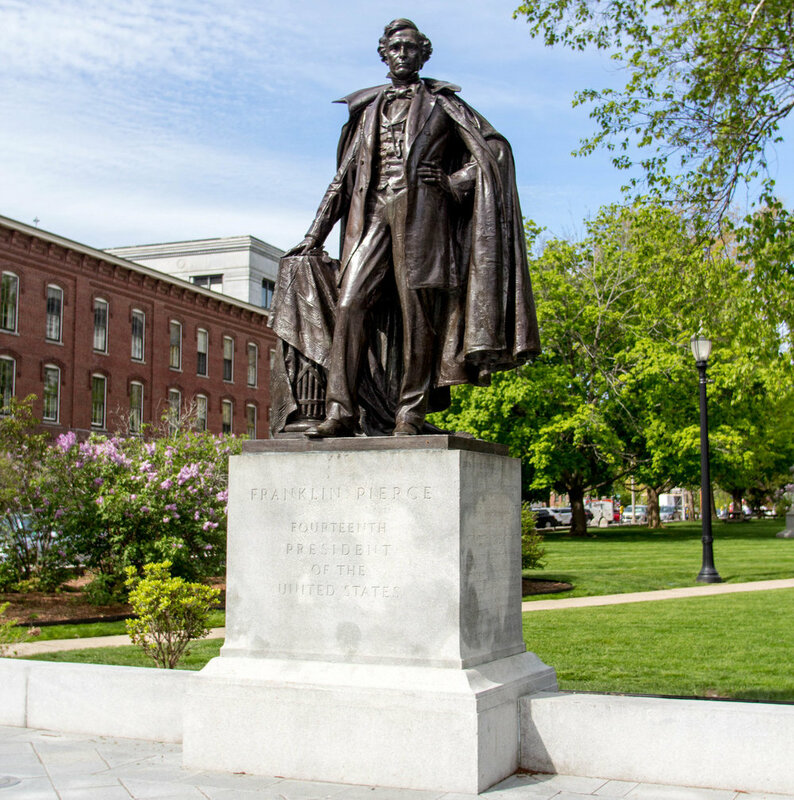 A lawyer and hero in the Mexican War, Franklin Pierce is the only president to hail from New Hampshire. He served in the White House 1853-1857. Sculptor Augustus Lukeman together with Daniel Chester French also designed the Pulitzer Prize gold medal. Franklin Pierce's Manse is open for public viewing (14 Horseshoe Pond Lane). 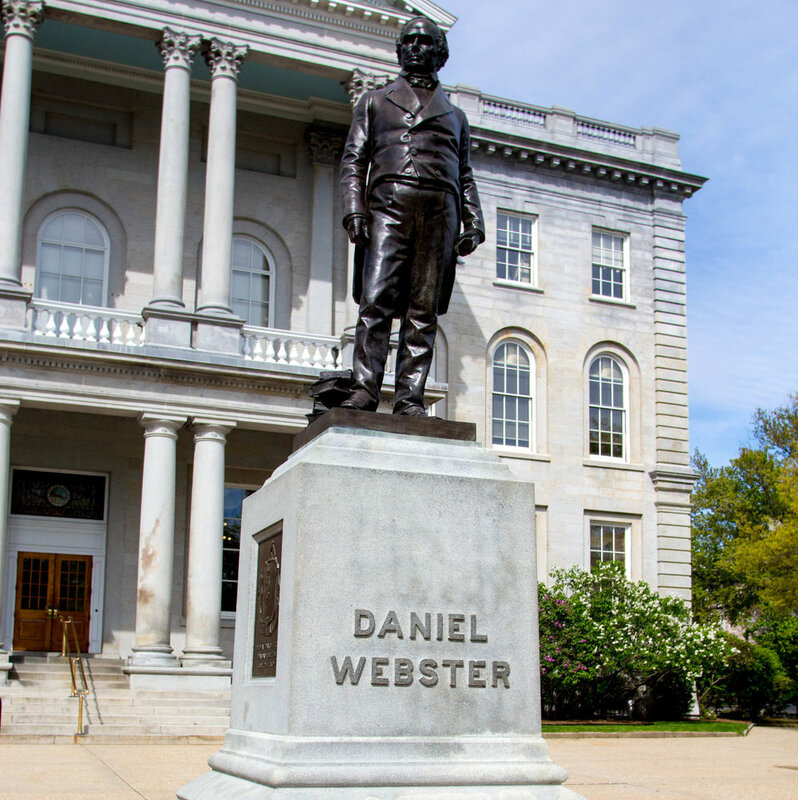 The most famous lawyer, orator and statesman of his day, New Hampshire native Daniel Webster (1782-1852) represented this state and later Massachusetts in Congress and served as Secretary of State under three presidents. This bronze casting of DW was designed by Thomas Ball and was cast in Munich, Germany weighing 2,000 pounds. Politician and lawyer John Hale (1806-1873) was a U.S. representative and senator from New Hampshire who took an early and forceful stand against slavery. This statue was cast in the same foundry as Daniel Webster in Munich, Germany to ensure matching finishes and proportions. Commodore George Hamilton Perkins served with Captain David Farragut in the Civil War and was one of tree men sent ashore to arrange for the surrender of New Orleans. The tablet below the statue, which depicts Perkins military life. The statue was sculpted by Daniel Chester French and designed by Henry Bacon. An abstract sculpture of a tree, which forms part of the ironwork gate into Eagle square. by Artist: Dimitri Gerakaris in 1983 using forged and color-galvanized steel. Location: Eagle Square, Main Street, across from the State House. This bronze statue portrays General John Stark in the military dress of a Revolutionary War soldier. The most famous Revolutionary War soldier and hero of the battles of Bunker Hill and Bennington, Stark coined the phrase "Live Free or Die" in 1809; NH adopted it as its motto in 1945. Sculpted by Carl Conrads and designed by John A. Fox. A statue by Brett Grill dedicated to Gov John Winant outside the New Hampshire State Library on June 30, 2017. John Winant held positions in NH, national, and international politics. He was the first man to serve more than a single two-year term as NH Governor, winning election three times. He went on to serve as US Ambassador to Britain during World War II. Concord is a place of art and artisans: From local jewelry and craft shops, to galleries and the League of NH Craftsmen. Art is part of the city’s heritage. Historic statues surround the New Hampshire State House and dozens of paintings adorn its halls. Public art lines Main Street. Murals and community art projects are springing up around the city. And now the City of Concord and the Greater Concord Chamber of Commerce have created Concord's Art on Main program, an annual, year-round outdoor sculpture exposition that enlivens and enhances Main Street. Mixed with Concord’s classical art, it creates an open-air gallery that is free to enjoy, and on view every day.